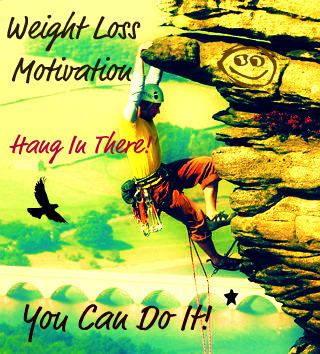 Weight Loss Motivation - Fasting Weight Loss Motivation & Inspiration - Hang In There! Losing weight is hard. Getting weight loss motivation can often be even harder. We can start fasting and/or dieting one day filled with zest and determination and, just a few days later, we are overeating again and wondering what happened. Yes, weight loss motivation is crucial but not always the easist thing to come by. So it is my aim in this page to refresh your mind and spirit so that, if you are stuck, hopefully you will refill your tank just enough to keep going one more day. That is how weight loss and any other goals are reached... ONE DAY AT A TIME. No matter how many times we may fall - we must press on. We must continue. We must dust ourselves off and get up again. There is no such thing as failure if we have the right atttide. If we learn something from each fall, then we have not failed. To the contrary, we gain insight into our behaviors and into what makes us tick. And to know ourselves is to have the opportunity to master ourselves IF it is followed by focused action towards the achievement of our goals... this case our objective being weight loss and improved health. I can pump you up and give you lots of weight loss motivaton here. But if you do nothing, then nothing happens. If you always do what you did, then you will always get what you got! Let's get to the point: if you are more than twenty pounds overweight, then action is needed to protect your health. Looking slimmer and feeling more confident is terrific and desireable, but the truth is that excess weight kills. That was the weight loss motivation that REALLY got to me. Yes, I felt bloated and unattractive, but even worse than that I was on the road to an early grave. I want you to realize that your desire to lose weight and improve your health should be one of the top priorities in your life. Why? Because if you don't it is only going to get harder and, in the end, you may find yourself having to deal with an illness that could have been avoided if you had taken corrective action now. So, my point is, WHAT ARE YOU WAITING FOR? :-) This is the moment you have been waiting for. The time is NOW to take action, lose weight and improve your health. These are not empty words of weight loss motivation. I come from a deep place of binging, obesity, isolation and darkness. It is as a result of practicing these principles that I have dodged certain death and now have the privilege of sharing this website with you. So forgive me if I don't pull punches. But I realize that this is truly a life and death issue for many of us. Life is too short... there is way too much to experience and enjoy. If you have arrived at this page looking for ways to shed excess weight and improve your health, then THIS IS IT! I want you to STOP procrastinating and "thinking about it". Rather, I hope that you START doing what ou have to do. Let the rest of your life begin right here and now! I'll do everything within my power to give you weight loss motivaton. But you have to become willing to do what it takes to produce the results, right? Click here to watch Self-Confidence Hypnosis Video - Chaper 2. Weight Loss Motivation - Picture a New You! Sticking to a weight loss plan can be hard because the transition between your current weight and your goal weight can seem a long way off. How can you maintain weight loss motivatoin when it seems like the payoff for your hard work and sacrifice will take forever to get here? One good way is to keep your mind focused on the outcome you're working toward, and how great it will be when you finally achieve it. That great outcome, of course, is your slender, hot new body! Staying focused on the delicious sense of victory and pride you will feel when you finally see that magic number on the scale is a great way to keep your motivation high and your commitment strong through the months ahead. 1) Write detailed descriptions of the outcome: Start keeping a daily journal about why you want to lose weight, and the great benefits that will come from it. For weight loss motivation, you can write about how much more energy you will have, how much more flexible and strong you will feel, how much lighter and sexier you will feel, how much more confident you will feel, and so on. Make these descriptions very rich in emotional language, like: "I will love feeling so proud of my body as I walk down the street. I can't wait to go shopping and try on a ton of outfits that make me feel so attractive and beautiful!" The trick is to focus intently on these mental images so that they trigger the positive emotions within you right now. 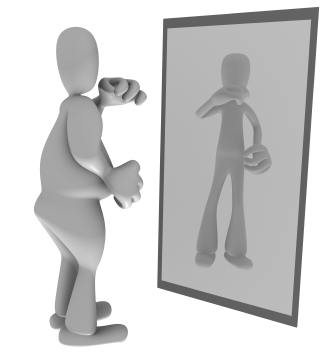 2) Create visual representations: Sketching, drawing or painting "snapshots" of your future lean and healthy self is another great way to get weight loss motivation. Draw a picture of yourself wearing that little black dress to your class reunion or that pair of jeans in the size you desire. Paint scenes of yourself lounging on the beach wearing nothing but a skimpy bathing suit. Add in little comments around the picture like, "Wow, I feel so lean, clean and healthy!" Don't worry if you're not a great artist. Your pictures don't have to be perfect - they only have to trigger a positive sense of excitement and joy as you focus on the great outcome you are working toward. That's it! Have you ever felt resentful because YOU had to be the one cursed with a weight problem? Many overweight people feel this way at times; they look around and see skinny people eating all they want without gaining an ounce, while the overweight person has to struggle and sacrifice for every pound lost. It's not fair! These feelings of resentment may be perfectly valid, but unfortunately the completely zap weight loss motivation. They simply keep you feeling sorry for yourself which can severely limit your progress. Step One - Be Grateful for the Challenge: Even though it's frustrating that weight is an issue for you, more important is what you choose to do about it. You can sulk and keep insisting that it's not fair, but then you will have not weight loss motivation at all. A better option is to be grateful for the challenge. Challenges may be unpleasant when we're in the middle of them, but they keep us growing! They make us stronger! They help us create much better circumstances than we would have without being challenged. Take a good long look at your excess pounds today, and thank them for being there. Thank them for stirring your inner strength and determination to strengthen your body and improve your health. Step Two - Bless the Hard Work: As difficult as it may be at times, bless the hard work you do to shed those excess pounds. Bless temptation when it comes knocking at your door, for it provides an opportunity to strengthen your willpower. Bless the exercise you do each day, for it provides an opportunity to strengthen your muscles. Progress would not happen if not for your hard work. Step Three - Be Proud of Yourself: Cheer yourself on and keep affirming that you CAN DO THIS. The best weight loss motivation is the one that you give yourself. Remind yourself that you are capable of much more than you think. When you reach a milestone, pat yourself on the back. When you manage to overcome a moment of temptation, compliment yourself! If you slip up, don't beat yourself up over it, just get right back on plan and keep going. Never look back, only forward. We have launched the dynamic FastingOlogy™ program, a 9-month training comprised of weekly lessons in PDF format delivered via e-mail, at a cost of $23 monthly. I have searched across the Internet and have NOT found any ONE course dedicated strictly to helping people transform their health and lose dramatic amounts of weight via fasting and detoxification. In FastingOlogy™, members are given constant weight loss motivation as they are guided through the process of transforming eating habits, achieving detoxification, as well practicing water and juice fasts from 24 hours to 30 days in length. It is a powerful life-changing program; check it out! Furthermore, if at any time you wish to receive some one-one-one coaching and fasting for weight loss support, you can visit the Coaching Page and sign up for daily interaction with me via private message board. The cost is $125 monthly, paid via Paypal. If you are planning a fast and would like some constant encouragement, motivation and questions answered, then I am here to be your coach! Don't' forget to drop by Fasting Forum I and/or Fasting Forum II and join the community conversation. You can ask for feedback on a question and/or concern, look for a fasting buddy and/or add your knowledge for everyone's benefit. Now lets go go detox diet fasting and talk just a little more about weight loss motivaton.